Novomatic global interactive business unit launches exciting new title for customers. Crazy Birds will cheer you up and make you smile on gloomy winter days! 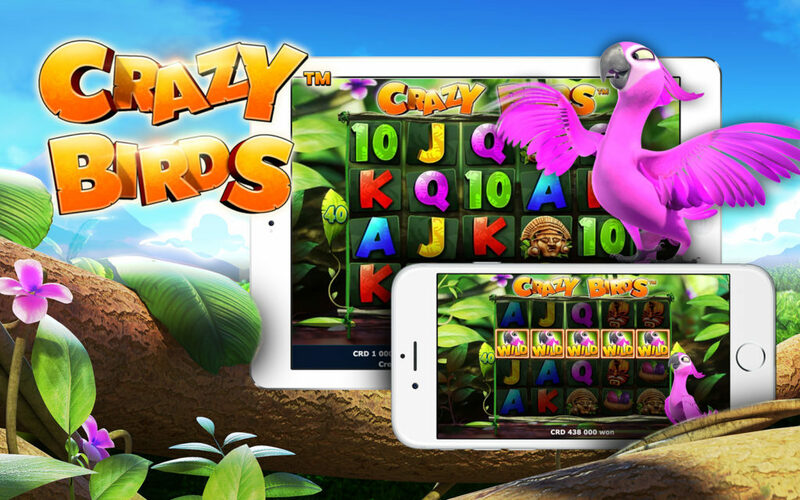 The feathered friends Potty, Rocky and Loopy fight for the affection of the elegant pink parrot, Candy, in this colourful, crazy and action-packed slot. This slot game takes its players on an adventure to a tropical island paradise full of pool parties, prize wheels and big wins. The three birds Rocky, Loopy and Potty use their individual powers to keep the players on the road to victory. The goal is to line up five identical symbols across 40 win lines in this 5-reel slot. A minimum combination of two matching symbols (next to each other from left to right on a win line) pays out for the Gold Coin and Statue symbols. Helpful symbols are the Wild Symbol – Candy, the pink parrot, who can substitute other regular symbols – the Free Spins symbol, which activates the Free Spins Bonus mode and the Pool Party Symbol, which triggers the Pool Party Bonus mode. Additional bonuses such as the Pool Party Bonus and the Free Spins Bonus ensure extra prizes.